Mark Kashman (@mkashman) is a senior product manager on the SharePoint marketing team. In March, at SharePoint Conference 2014, we announced a lot of goodness “coming soon” to OneDrive for Business in Office 365. Now, two months later, we’re beginning to roll out some of the user experience innovations and refinements, including Simple Controls, Site Folders, smarter Search, and more. The new web interface of OneDrive for Business appears when you click OneDrive in the Office 365 top navigation. We believe that the user experience needs to be clean, simple, intuitive, and consistent—while maintaining the best-in-class capabilities to store, sync, and share—and that you should have the best destination to get work done. Period. This is why it’s important to us to keep improving your primary document collaboration interface. Let’s dive into the details of the latest improvements. We’re making it even easier to achieve the most common tasks in OneDrive for Business. The new Simple Controls (new, upload, sync, edit, manage, and share) appear directly above your personal work document folders. With one click or touch, you can create new Office documents, upload files, initiate sync to take your files offline, share your files internally and externally, and more. Simple Controls were designed with quick access in mind. You will also see Simple Controls for all team site document libraries. 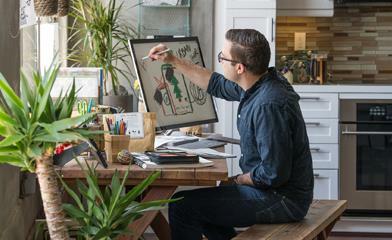 No matter where you create, upload, and sync from, this new experience awaits your mouse and finger. New Simple Controls give you quick access to working with and managing your work documents in OneDrive for Business. So you decided to follow a SharePoint Online site—one of my favorite features of the original SharePoint 2013 release. I bet one of the main reasons you choose to follow a site is for the content you and/or others manage there. This is where the new Site Folders comes into play. We added a Site Folders link to your main OneDrive for Business web view that takes you directly to those document libraries within sites you follow. With fewer clicks you can access the content you need, right from OneDrive for Business. OneDrive for Business gives you one place for all of your work files, whether it’s your personal work documents or those shared on team sites, and now you can manage all of those from one location in OneDrive for Business. 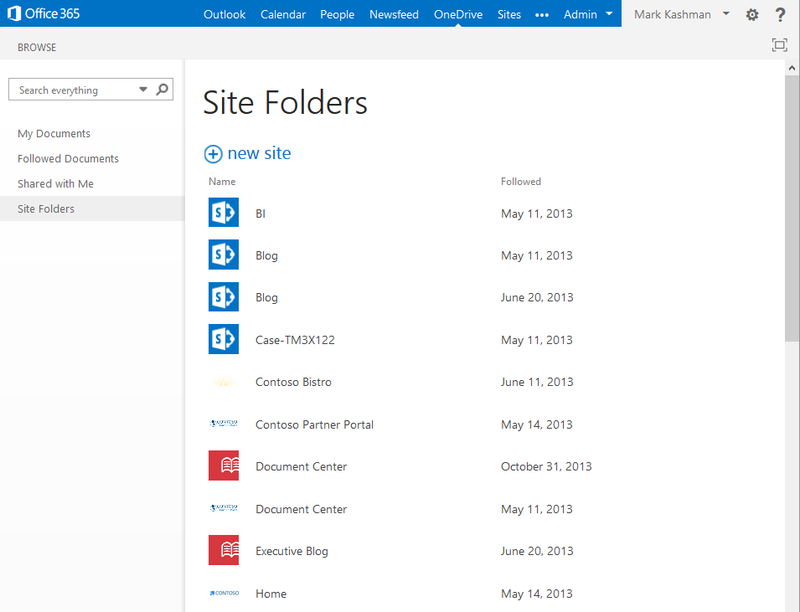 Site Folders are document libraries that live within the SharePoint Online sites you choose to follow. Start typing = start finding. The new OneDrive for Business search box is now smarter. You simply start typing to find a document that was shared with you, or one that you tucked away several folders deep. And just as important as finding what you are looking for is taking immediate action—like sharing these files—directly from within your search results. Note the circular sharing icon in the image below. The OneDrive for Business search box is scoped to the content, documents, and folders that have been shared with you and files that live in your Site Folders. This means you’ll find what’s closest and most relevant to you much faster. You’ll also notice in the image below that the OneDrive for Business search box moved from the upper right to the upper left. We did this for greater consistency across the Office 365 experience. Now, when search your mail, calendar, contacts, and content, you’ll click in a search box in the upper left of most any Office 365 page in your environment. 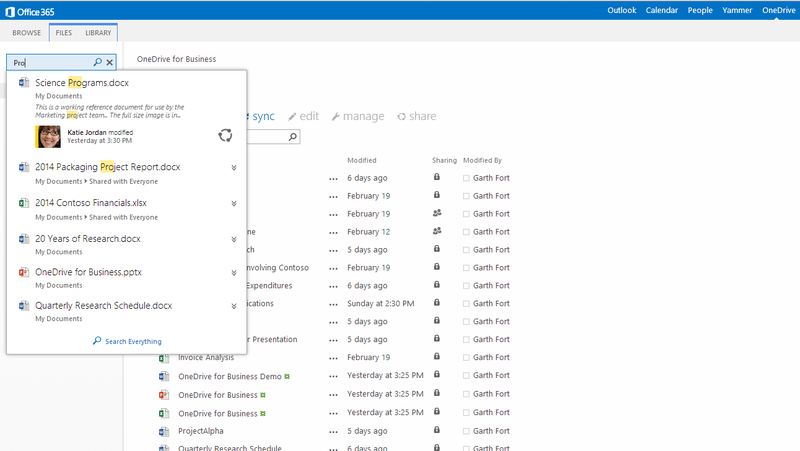 The OneDrive for Business search box is now smarter and more action oriented. OneDrive for Business is also getting a face lift. We’re updating where your profile picture appears. When another user performs a People Search and finds you, they will primarily discover your About Me page, where your profile picture still appears. (The About Me page is also being improved to highlight documents and people you have in common with the person viewing your page. Note the new tool tip pop-up in the image below that helps describe some of the changes being made.) Soon your profile picture will appear across all of Office 365, when it becomes a part of the evolving global top navigation bar. Note: your profile picture will no longer appear in the upper-left portion of your OneDrive for Business Web user interface. The About Me page still displays your profile picture, and now it includes documents and people you have in common with the person performing the search. We’re also making it super easy to find and use your OneDrive for Business Recycle Bin. This will appear in the left-hand navigation area of your OneDrive for Business web view. As we move forward, we’ll continue to listen to your feedback and rapidly innovate the user experience to best meet your ease of use. So please, let us know what you think by keeping in touch on TwitterandFacebook. ‘Til then, happy store, sync, and sharing. Q: When will I see these changes for my OneDrive for Business? A: We are now rolling out these updates worldwide. The rollout will occur over the next few weeks. It is possible that users’ peers in the same company tenant may see the changes at different times, depending on how we update the various farms, tenants, and users in Office 365. 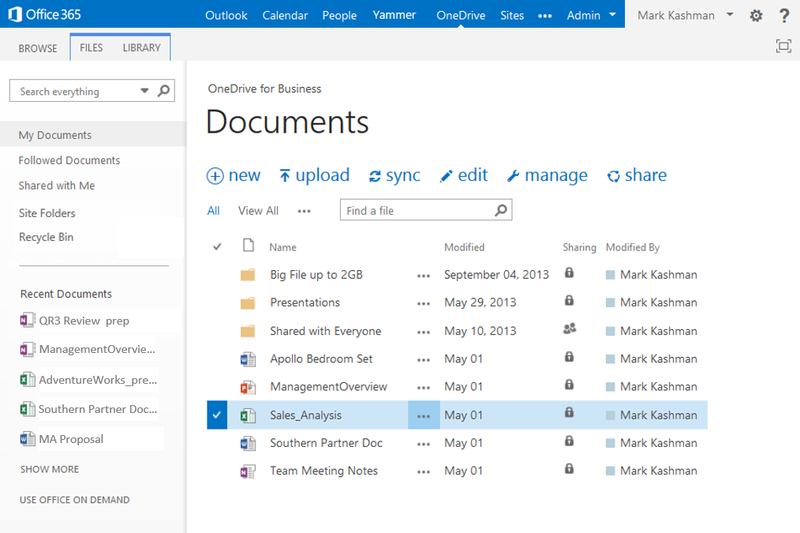 Q: Which Office 365 plans will get these OneDrive for Business improvements? A: All the above announcements apply to all Office 365 for business plans. Specifically, these plans are: Office 365 Small Business (P1), Office 365 Small Business Premium (P2), Office 365 Midsize Business, Office 365 Enterprise E1, E3, and E4, Office 365 Education A2, A3, and A4, and Office 365 government G1, G3, and G4. Q. Does this announcement apply to the OneDrive consumer user? A. No. This article does not apply to the OneDrive consumer offering. This is pertinent only to the OneDrive for Business offering within Office 365. Q. Does this announcement apply to Office 365 government subscribers? A. Yes. This article does apply to Office 365 government G1, G3, and G4 offerings, because it is a refinement of the user interface and does not change the underlying data infrastructure. Q. Does this announcement apply to Office 365 dedicated subscribers? A. No. The Office 365 dedicated plans are not receiving this same update, because they are managed in a unique, isolated infrastructure.